Lanolin is a unique organic substance derived from the wool grease coating on raw sheep wool. It is an all natural, incredibility effective substance that acts as a moisture barrier and lubricant. WoolWax® Undercoating Formula is a lanolin based corrosion inhibitor developed solely to protect the undercarriages of automobiles and trucks. Our lanolin is blended with other proprietary agents to provide long term corrosion protection. WoolWax® will provide long term protection (annual application) against salt, liquid calcium chloride, brine, and all other ice control agents that are being used by municipal departments. Most other undercoating products contain up to 70% solvents, which make these products very thin and watery. Without a very thick viscosity, these products break down and wash off quickly. WoolWax® is solvent free and very thick and viscous. It applies like a heavy latex paint, which makes it very resistant to wash-off. WoolWax® does not dry. It remains soft and pliable and continues to be active, migrating into all the inaccessible areas. Woolwax® contains much more raw woolgrease (lanolin) than any competitive product. This makes Woolwax® thicker and much more resistant to wash off. Thereby providing a longer period of protection for exposed undercarriage areas. 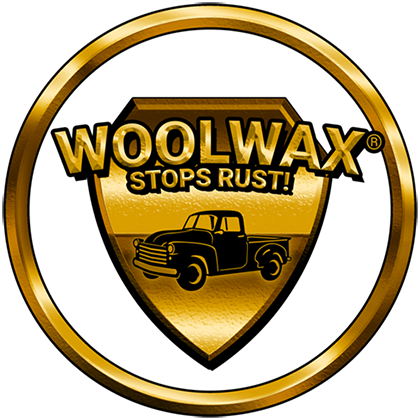 WoolWax® has quickly become the most trusted name in vehicle undercoating protection. Municipalities, Fire Departments, Undercoaters, and snow and ice removal companies all throughout the northeast have switched to using WoolWax® for their undercoating needs. WoolWax® is a heavy duty industrial grade lanolin/woolgrease formula that provides powerful long term corrosion protection. Because WoolWax® is built thicker, it is more resistant to wash-off than any other product that we have tested. WoolWax® is built to last longer ! Available in clear and black. Woolwax® 12 oz. Aerosol Spray Can. WoolWax® Undercoating Five Gallon Pails. Clear & Black. Free shipping. WoolWax® Lanolin Undercoating 55 Gallon Drum. Clear & Black. Free shipping. Woolwax Auto & Truck Undercoating kit #3 (Five gallon pail). Woolwax® "Pro" Undercoating Gun with (3) bottles (empty) and (2) flexible extension wands. Lanolin based rust preventive and corrosion inhibitor. Works great on outdoor power equipment. Long term lubrication for locks, hinges, garage door tracks, etc. More woolgrease (lanolin) in WoolWax® than any competitive lanolin product.